I'm still runnin'. Last week I started training for a half marathon in the spring, using the Whatever Nancy Says training program. I think it's actually Jeff Galloway's program. Anyway, tonight's run was pretty cold. It was relatively clear and calm out, but I nearly froze until I warmed up at about the half mile mark. Gonna try this Garmin Connect thing for a while. Edit: Nope, switching back to SportsTrackLive. Nancy, Liz, and I ran the Run Like the Finn 5K benefit run/walk on Saturday. 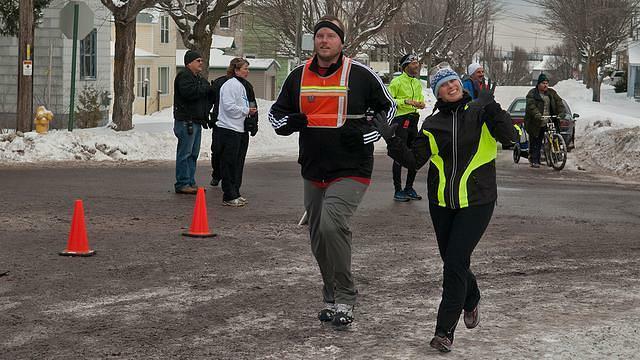 The event raised support for Amy Roberts, who was hit by a pickup truck while running on 15 Dec 2011. More information is on the Facebook event page. It was a fun run, and the first event of this type I've been in. There were reportedly 700 entrants, and the mass start was a hoot. I saw a ton of people I know, including G, who is everywhere and took some great photos of the event.